I got my bear in 1976. My Grandma was dying and they were sorting out things in the loft and I was given him, she died the same day. My Mother said it was her bear and she had it when she was little, she remembers it being taken off her for being naughty and she never saw it again. He was found in a plastic bag and in the bag was fur that had fallen off (I used to think because he was taken from my Mum he was sad and his fur had fallen out in shock). He had one green button eye (not original), felt paw and feet pads. My horrible brother pulled it's head off and threw it out of the window when I was a child and I opened him up to stitch his head back on, it was on a cardboard disc and would move originally and he was jointed. Inside he had cream rags and I think it's called Kapoc? filling (I read somewhere) and I seem to remember a little bit of shavings or straw but might have imagined this and there wasn't a lot it was mostly the cream rags and stuffing. Inside he had a mechanism that I think you pushed to make a sound, a sound like squeak occurred when you pushed it but it was a paper type thing and hadn't worked. My Mother said she never remembered it making any sound at all which made me think maybe it wasn't new when she got it. My Mother is 75. The eyes I put on they are black metal cufflinks so are not original. I'd love to know a little bit more about it if anyone can help. I've looked over the years and even bought a book on Teddy Bears but with little success. I don't think he'd have been very expensive when got (if he was bought new) as my Mother's family never had a lot of money. Approximately 16" height by 5.5" width and 530g. 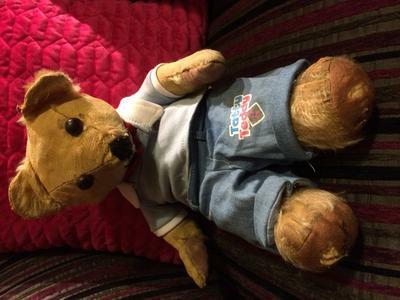 Thank you for taking the time to read this, hoping you can help identify my old bear. Paul.